Following on from Montblanc's release of the Antoine de Saint-Exupéry Encre Du Desert last year alongside a pen as part of their Writers Edition series Montblanc has now released this ink, Petit Prince Red Fox, based on the fox from Saint-Exupéry's The Little Prince. Another ink released at the same time is Swan Illusion Plume (as part of the Patron of the Arts series) which is named after Ludwig II of Bavaria who is also known as the Swan King, you kind find that review here. Montblanc Petit Prince Red Fox is described on sticker affixed to the base o the bottle as "Brun-orange" and I think describing the ink as a brown-orange is pretty accurate. The ink, in swatch form, is of average saturation but once you ink it in a pen the ink on paper becomes very watery and unsaturated. This isn't a rich vibrant ink at all. The ink feels wetter than other Montblanc's but it's not a wet ink. It performs well on most papers and well-enough on poor quality paper like Leuchtturm1917, or various copy paper. As with nearly all Montblanc inks (as well as some inks from other brands, including Caran d'Ache and Robert Oster), Tomoe River saps the saturation out of this ink. I'm not sure why this happens, and it does seem to happen to red and oranges more than other hues but it can make the ink look pretty sad. It's not too bad here, however. There is no sheen in any practical sense at all but on Midori and G. Lalo there was some silvery sheen on the swatch where it pooled. This will not, in my experience, translate to sheen in the written line. There is also no sheen on Tomoe River, possibly related to how Tomoe River saps the saturation out of the ink. Chromorotraphy shows, plainly, a grey moving to a brown orange. Not the least interesting chromatography but certainly not much going on here. Dry times are very good, especially on Tomoe River. Again, I feel like what ever causes the desaturation on Tomoe River also affects this. On Rhodia the saturation isn't too bad. It's a little watery looking in the written line but it isn't bad. The shading is great here and there is little to no water resistance. There's no smearing and the ink feels nice to write with. 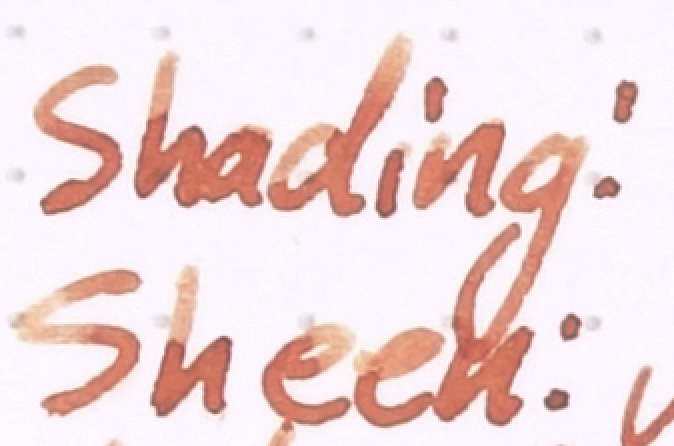 Diamine Terracotta is too dark and brown. Montblanc Leonardo Red Chalk even more so. Sailor Mitsukoshi Danjyurocha is a little too orange and definitely too saturated. Montblanc Carlo Collodi Brown is to yellow and brown. Kyo Iro Moonlight of Higashiyama is too yellow and too saturated. And Diamine Burnt Sienna is too brown as well and a little too saturated. Most of these inks are too saturated and miss out on the slight pinkness of Montblanc Petit Prince Red Fox. Mitsukoshi Danjyurocha and Kyo-iro Moonlight of Higashiyama are probably the closest. Shading is very good on Tomoe River which tends to flatten inks a little. There's some nice halo going on with the sharp and thin shading right on edged of each written line. Saturation is pretty low on Tomoe River but there is still no smearing. All three Montblanc inks on the page of lost some saturation compared to when on Rhodia. Diamine Terracotta is still too dark and brown but not also a little too orange. Montblanc Leonardo Red Chalk is a closer saturation now but too yellow or orange. Mitsokoshi Danjyurocha works very nicely in terms of the hue but is way over saturated. As with Red Chalk, Montblanc Carlo Collodi Brown is now a similar saturation level but it's also a similar brightness. Kyo-iro Moonlight of Higashiyama has also dropped a little in saturation and is pretty similar now to Carlo Collodi. Diamine Burnt Orange actually looks fairly similar now but a little too saturated. For me Mitsukoshi Danjyurocha is similar but more saturated (which might be a good thing) and Diamine Burnt orange is similar with the same caveat. This is a nice colour and the fact that it's a little washed out actually improves the ink for me, as a collector, because it's more unique. Speaking, as a user, however, this somewhat washed-out look doesn't appeal to me (but this is a subjective issue). There's certainly a place for and an appreciation for more pastel-like inks but I'm just not one to have that appreciation (especially for coloured inks). This isn't a bad ink and inks and I do like how Montblanc inks are getting wetter but this particular ink isn't the type of colour for me and at €35,60, AU$50, and US$43 these inks are much more of an investment than the 30ml ones were in the past and I feel it's a good idea to get an idea of the ink before buying compared back with the 30ml bottles which you could just reliably impulse buy.